A spacious FOUR DOUBLE BEDROOM, TWO RECEPTION Grade II Listed Regency Residence is in need of modernisation. A spacious FOUR DOUBLE BEDROOM, TWO RECEPTION Grade II Listed Regency Residence in need of modernisation. 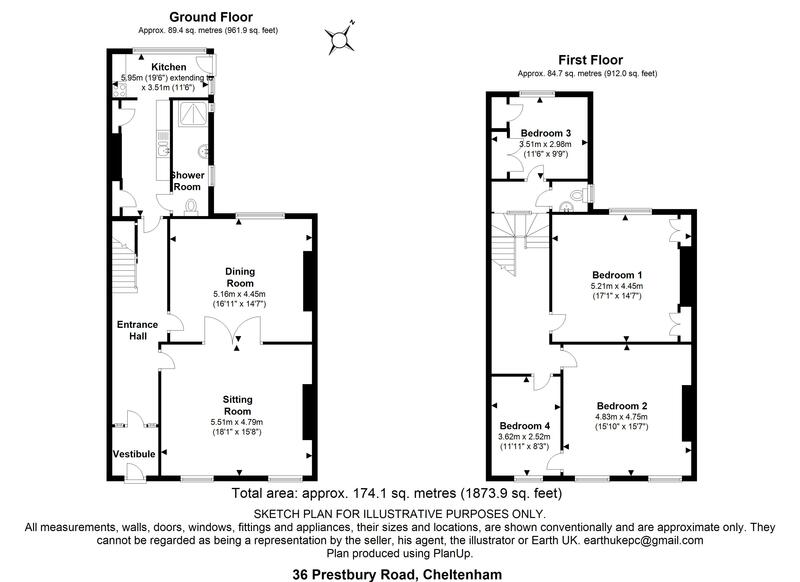 The accommodation comprises: Entrance hallway, large living room with doors opening into equally large dining room, kitchen, downstairs shower room, back porch leading into rear garden. Upstairs there is a good size landing and four DOUBLE bedrooms. The rear garden has gated pedestrian access at the back and the front garden has access to the TWO BEDROOM GARDEN FLAT ALSO UP FOR SALE - Guide Price of £275,000. The house itself requires modernisation but in doing so does have many likely original features of the period. The accommodation is arranged to provide entrance hall, sitting room, dining room, kitchen, ground floor shower room, FOUR BEDROOMS and first floor cloakroom/potential bathroom. There is a walled garden to the rear, which could provide potential off road parking? The property is found around half a mile distant of Cheltenham Town Centre and just over quarter a mile or so away from delightful Pittville Lawn along with the Historic Grade II listed Pittville Park which boasts lakes including a delightful boating and fishing lake, children’s play area and aviaries, tennis courts, skate park and a pitch and putt golf course. Central Cheltenham is where you find the popular shopping districts of the High Street which is soon to have a John Lewis flagship store, the Regent Arcade, The Promenade and Montpellier which boast an extensive range of shops, boutiques and eateries including the newly open restaurant The Ivy. There is also a regular market and Farmers market held on the Promenade. Cheltenham is renowned for its Festivals which include the Literature Festival (host to a wealth of famous people), the Jazz Festival, Science Festival and the Food and Drink Festival; many of which are held in the historic Town Hall and its beautiful Montpellier Gardens together with the Everyman Theatre which was restored in recent years. Not forgetting the very popular Cheltenham Gold Cup Festival held at Cheltenham’s Prestbury Park Racecourse. Likely original front entrance door with frame having small obscure glass panels and a likely original letter box. Corniced ceiling, tiled floor, likely original inner door with glazed panels to either side and above. Corniced ceilings, stairs rise to first floor with likely original bannister, radiator. Likely original features include corniced ceiling, ceiling rose, picture rail, deep skirting, sash window to rear and internal door; radiator. Windows to rear and side, cooker point, appliance space, storage cupboards, tiled splashbacks, door with steps down to garden. Obscure window to side, pedestal wash basin, radiator, tiled walk-in shower area, tiled walls. Low level wc, extractor fan. likely original sash window to rear, radiator, coving to ceiling, range of built-in wardrobes/cupboards. Low level wc, wall mounted wash basin, window to side, tiled walls. (We feel that by encroaching into Bedroom 3 a further family bathroom could be created – subject to the necessary permissions required). Likely original sash window to rear, two built in alcove wardrobes, radiator. Likely original sash windows to front and picture rail, radiator. For Bedroom 3 see Mezzanine Landing. Likely original sash window to front, radiator. At the front of the property is a garden area with mature plants and shrubs together with wrought iron fencing, gate and decorative panels by the retaining wall of the garden flat. The rear garden has red brick walling and is arranged as a patio with mature shrubs and pedestrian gate leading to Pittville Crescent Lane. There is potential to create off road parking at the rear (subject to consent). Tenure Freehold - Important - Please note the property is divided into two separate ownerships at present. The sellers of 36 Prestbury Road own the Freehold of the whole building whilst the Garden Flat is subject to a 999 year lease. Council Tax: We are informed by Cheltenham Borough Council that the properties are in Band ‘F’ with £2,400.25 for the house and Band ‘A’ with £1,107.80 being payable for 2018/2019.